Victoria, Mahe (Seychelles) – April 17, 2018 (travelindex.com) – The cost of operation in Seychelles continues to rise, irrespective of the fact that the islands are in competition with other similar tourism destinations. Increases in food and electricity costs are serving to price Seychelles out of the market. Smaller operators are feeling the burden of these increases, which are stifling their viability and potential growth. 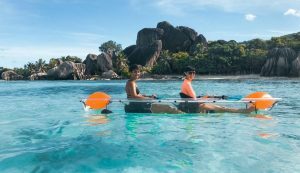 Seychelles is already battling with an essential part of the industry – service – and remains reliant on foreigners to fill the gap. Recruitment of foreign workers is becoming increasingly difficult, which is further impacting on the prosperity of the service industry. It is not, and will never be, acceptable to merely force down the throat of the industry any unemployed citizen who lacks the basic qualifications, skillset and attitude required for the service industry. With service being key to customer satisfaction, it is important for employers to have a skilled labor force. The topical issue regarding a suitable access to the idyllic Anse Georgette of Praslin, which remains a public beach, has been on the cards for a long time. However, the country seems unable, or perhaps unconcerned, to resolve the matter for a more conducive environment for its tourism industry. The current access through the private Golf Couse is not an ideal solution and will result in someone being hit by a golf ball as they navigate the course to reach the beach. The little used main access from the hillside is an unsafe option; someone lost his life a couple of years ago on that same track from Mont Plaisir. A sensible option would surely be to construct a wooden pathway bypassing the golf course and providing tourists and locals alike unfettered and safe access from the main gates of the hotel to the beach. Air Seychelles had approximately 200 people on a redundancy list. Vimentis Group of Capt Christopher Lespoir working in partnership with the University of Seychelles, the Chamber of Commerce among others, which was currently holding a specialist training and conference in Seychelles said:- “As we were about to launch the 3rd seminar in Seychelles, we took the decision to give all the ones impacted by this a free ticket. Short notice, but 13 came and I can promise that they are not worried about any ‘job security’ anymore”. Captain Lespoir and his group need to be congratulated for their kind gesture. Actions speak louder than words. The former Air Seychelles staff are also congratulated for taking their future into their own hands. When a door closes another will open. Seychelles waits to hear of the salaries of the senior staff of the airline and their respective perks, such as any housing allowances they may be enjoying, as their fellow team members are dropped from employment. Today, the airline is moving its City Centre Offices out of Government Buildings in Victoria and moving instead into commercial properties. Terry Sandapin, the Chairman of the Save Assumption Group, has shared a photo of his elderly mother taken at a protest demonstration in Victoria. Madame Hooper Hoareau is now 85-years-old and suffers from Parkinson disease, but was still determined to be present to say “No is No”. The recent news published in India speaks of the remodelling of the Assumption Island project for a military base with India. It remains a sad determination by those in power to refuse to hear the desperate plea of the people about the fate of one of their Nation’s island treasures. Furthermore, it has not gone without notice that Assumption Island has recently been removed from a high biodiversity protection zone under the highly praised and world renowned Marine Spatial Planning (MSP) initiative. It was only in October 2017 that Assumption was classed as a High Biodiversity Area- Zone 1, alongside Aldabra. However, it has somehow and mysteriously been removed. When and why did this happen, remain pertinent questions for the relevant Authorities to answer. With the increased discontent of the Seychellois people in this regard, the only honourable thing to do would be to call for a referendum and let us have our say.